Regular nail clipping, or trimming, should be part of the routine care of your pet. It is essential for elderly and indoor pets, whereas outdoor pets may wear their nails down naturally. The requirement for nail trimming can vary depending on breed, age, level of exercise and the environment in which your pet is kept. Some breeds may have nails that grow more forward than downward, and therefore no matter how much exercise they get on rough ground, it is unlikely they will wear down naturally. 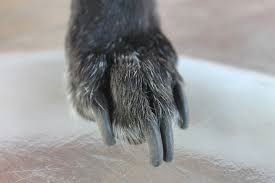 Some dogs may benefit from having the tips of their nails taken off once every week or two, however for most it will be longer than this, and you will have to decide what is right for your dog by inspecting its nails on a regular basis. Certainly if you notice a change in the sound of your dog’s nails on hard floors this is a pretty good indication that it is time for a trim. Why is nail clipping important? If a pet’s nails are allowed to grow, they can split, break or bleed, causing soreness or infection in your pet’s feet and toes. Long nails can get caught and tear, or grow so long that they can curl backwards into a spiral shape that can make walking very painful for dogs (it’s like walking in shoes that are too small).Cats are able to retract their claws so this is less common for them, however,cats do still need to have their nails regularly clipped (especially if they don’t get much natural wear and tear). We have a variety of nail clippers that suit different pets – from the very small to the very tall. Make an appointment today to have your pet’s nails checked. We can also teach you how to do it if you would prefer to cut them yourself.